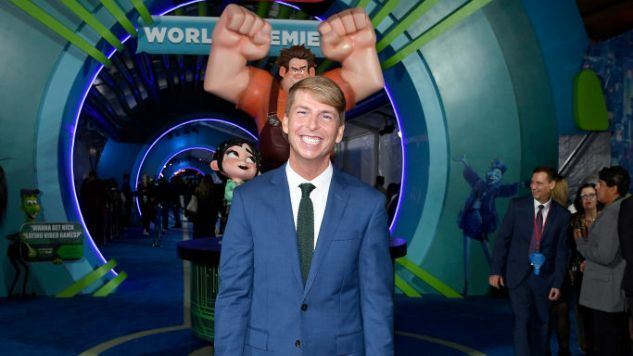 Jack McBrayer Doesn't Know if There's a Fix-It Felix Sr.
Fix-It Felix Jr. is a mystery, even to the man who plays him. Despite appearing in two movies, 2012’s Wreck-It Ralph and 2018’s Ralph Breaks the Internet (which is out now on 4K, Blu-ray and Digital), the ever-helpful, always friendly repairman’s background remains shrouded in secrecy. Nobody even knows if there’s a Fix-It Felix Sr.
I’m actually serious about this. I write about videogames, too, and have been playing them since… well, long ago, and if I ever came across a real game called Fix-It Felix Jr. I would assume it’s a sequel. Donkey Kong Jr. and Jr. Pac-Man established that precedent. Somewhere within the world of Wreck-It Ralph there’s an original Fix-It Felix arcade game, and I’m sure it’s a crucial part of that world’s fictional videogame history. Unfortunately Ralph Breaks the Internet isn’t a sobering, reflective look into the family history and home life of Fix-It Felix Jr. In fact Felix is hardly in it. He does have a prominent storyline, although most of it happens off-screen. He and his partner, Sergeant Calhoun from the fictional game Hero’s Duty (who’s voiced by Jane Lynch), adopt 15 of the racers from Sugar Rush, the game that Sarah Silverman’s lead character Vanellope Von Schweetz lives in. At first the stress of going from zero to 15 especially hard-to-handle kids seems to break Felix, sending him to Tapper’s for a drink. And then, over the next hour, Felix and Calhoun somehow whip those kids into shape off-screen. As entertaining as Ralph Breaks the Internet can be, a part of me wishes we had stuck in Litwick’s Arcade so we could see the domestic drama unfold between Felix and his small army of uncontrollable kids. Ralph Breaks the Internet can’t just hang around the arcade, though. It has new targets in its sights, and newer technology to parody. As the title suggests, Ralph (once again played with adorable shagginess by John C. Reilly) gets sucked into the information superhighway when Litwick’s installs Wi-Fi, with his best friend Vanellope in tow. Together they do the things that they do and learn the valuable lessons of life and just generally grow and develop as both people and computer files. All that’s secondary to the real drama at the heart of the movie, though. I couldn’t stop thinking about Felix, and the man who played him. What would Felix use the internet for? Would he search for parenting tips to help corral the unruly horde of Sugar Rush racers that now ransack his home on a daily basis? Or would he just use it as an escape from that chaos, drowning out the world around him while he watched home repair videos on YouTube and stared at photos of tools? He might call it dumb, but that’s just modesty. McBrayer’s not ashamed of his decades-long love for email. His ability to retain a sense of wonder about one of the most basic and mundane internet functions—one that’s been partially superseded by the quicker but less personal medium of texting—reveals the same kind of optimism that Fix-It Felix Jr. is known for. Hopefully someday soon, in whatever format the Wreck-It Ralph universe takes next, Fix-It Felix Jr. will get to send one of those wonderful electronic letters to his long-lost father, and his fans will finally know the truth about how their favorite videogame handyman came into this world. Ralph Breaks the Internet is now available on 4K, Blu-ray and Digital.